Graphs are wonderfully useful things. Once you have learned a few simple rules, you should be more than able to cope with their use - even if you don't enjoy it! 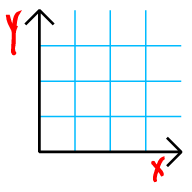 X and Y are variables that depend on each other. Normally we treat Y as depending on X.